A Goffins Cockatoo is one of the smaller species of cockatoo. It is white in color with a rim of pink-orange feathers around the bill and with yellow feathers under the wings. The bill is bone-colored and the eyes have a light blue ring around them. Goffins cockatoos are popular as pets. For this species of cockatoo you need to have CITES papers to own it, transport it or buy it. The Latin name of this species is Cacatua goffini. That also explains its common name. Goffins Cockatoos occur on the Tanimbar islands, these can be found in the South-Easter Mollucan islands (Maluku Tenggara) halfway between Timor and New-Guinea. Goffini’s live there in the tropical forest or on the edges of this forest. 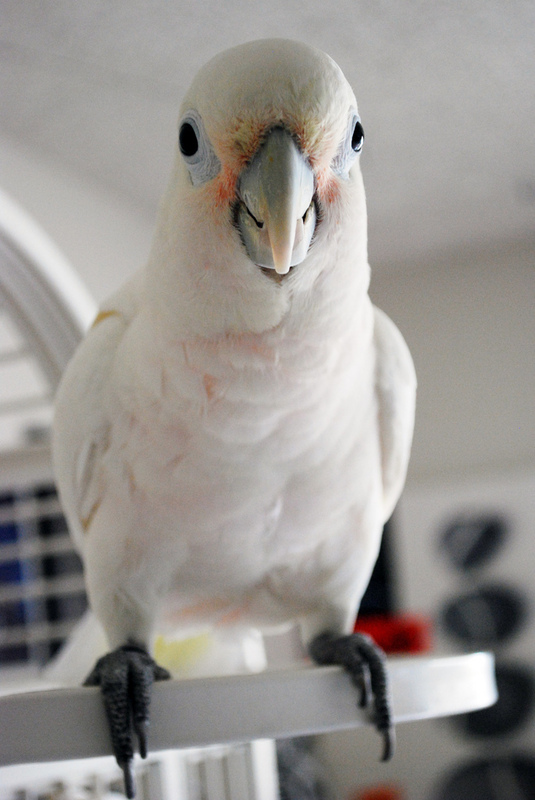 It is possible to keep this species of cockatoo as a pet, but it can be troublesome at times. This is because this species can become really fixated on one human and really agressive to all other people. When a Goffin’s cockatoo is not properly socialized and tamed when young, it won’t become very tame. Don’t let the size of this bird fool you either; they are excellent screamers. This species is one of the few species reported to scream even in the night. Of course every bird is unique and there are plenty of affectionate goffini’s that can be friendly to strangers. When a Goffin’s cockatoo has grown attached to his owner or the people in the family, it can bring a lot of joy to the family, for example by behaving like an hyperactive clown. Usually they are very active in “dancing”, screaming, talking and biting in things. For a cockatoo this species is pretty good in imitating sounds and speech.